From the archaic German word ‘Demant’ which means ‘diamond’, in allusion to its very high brilliance resembling that of diamond. 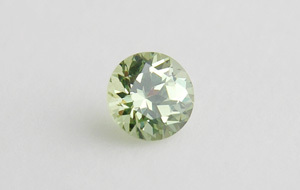 A green variety of andradite. 2 specimens: 0143 — 0.13 ct, Namibia; 0240 — 0.15 ct, Namibia.